Founded in 2005, Uncrate is the original buyer's guide for men, both online and in print. 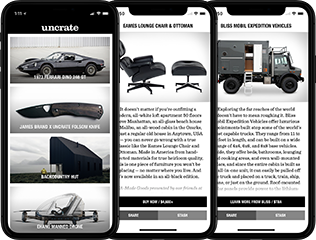 Widely known for uncovering the best men's gear, automobiles, and apparel, Uncrate reaches a large, influential audience of discerning men not found together anywhere else. Our readers visit multiple times per day to find out about the latest and greatest products, videos, and destinations for men, allowing select brands the opportunity to reach a receptive group of powerful purchasers and tastemakers.